By this time next week, I'll be in the city of Las Vegas competing in the 3rd Annual World Food Championships in the Recipe (Cheese) category. This will be my 2nd time competing, my 1st time going by myself and I'll be 100% nervous. Back in June, I entered and won the Southern Biscuit Flour Biscuit Bake-off Contest beating out dozens of other contestants with my White Cheddar & Chive Biscuits. These biscuits are sincerely epic. Not only do I use shredded sharp white cheddar cheese, I use coconut oil in ADDITION to the butter. And my butter? I stick it in the freezer to freeze solid before I grate it right into the bowl before mixing. Coconut oil acts like shortening (Crisco) but with no cholesterol. Such a small amount is used, the flavor of coconut is not detected. The butter stays solid long enough to make sure the mix stays cool and forms beautiful pockets within the biscuits crust. OH! It's a thing of beauty! Barely manipulating the dough lends itself to a fluffy, yet crusty and buttery biscuit that is truly amazing. Secret ingredient number two: mustard powder, to add a little tang and twang to the biscuit. I use freshly chopped chives, although dried chives work just fine, to give the biscuit a little more depth and a bit of freshness. It's one of the best recipes I've ever formulated and one of the best biscuits I've ever eaten. I've kinda made them on the blog before, but I've modified them. And I'm going to share the recipe with you. I want you to make these biscuits. I want you to experience the joy that is this biscuit. Heat oven to 400 degrees. Place stick of butter in the freezer for a minimum of 20 minutes to freeze solid. Combine flour, chives and mustard powder in a large mixing bowl. Use a food processor or box grater and grate the butter into the flour mixture. Add coconut oil to the flour and use a fork, two knives or pastry cutter and process the mix until the mixture forms crumbs the size of peas. Drizzle the milk over the flour until mixture comes together. In a small bowl, mix the extra-sharp white cheddar with a few tablespoons of flour and add the cheese to the dough. Mix only until roughly combined. Dump out onto a well-floured surface and knead lightly about six times. Roll the dough out to into a rectangle. With a sharp, floured knife, cut the dough lengthwise in half and then across in quarters, making 8 squares. Alternatively, use a biscuit cutter or a drinking glass, dipped in flour, to cut out 8 biscuits. Re-work the scraps and cut out 2 more biscuits. Transfer biscuits to a sheet pan lined with parchment paper and bake for 20 to 25 minutes, until the tops are browned and the biscuits are cooked through. So I'm going to go to Las Vegas armed with sponsorships from the City of Winston-Salem and Southern Biscuit Flour. Without the two of them, this foray into the competitive cooking area couldn't happen. I'm also going armed with over 20 lbs. flour, biscuit mix and cornmeal from Renwood Mills, llc and make the heck out of these biscuits and whatever the heck else I decide to make! I'm going to make you proud. I'm going to make myself proud. I'm going to come home a Biscuit Queen. To level the playing field, all of the contestants in my category are supposed to make a 2nd dish called a "Structured Build" and the theme is "South of the Border"... that could mean.. anything. Mexican, Argentinian, Patagonian.. lol I'm still trying to figure out what that means and what I'm going to make. It may be another biscuit. It may be fried chicken. I'm not sure. The only thing I'm sure about: I'm gunning for that top $100,000 prize. And I hope I win. How exciting! The biscuits sound fabulous! Gooc luck in Vegas! Oh how cool!!! And now I'm craving biscuits. There are so many things I love about this biscuit recipe! The mustard, the coconut oil, the chives...OMG. Just incredible. Very best of luck in the competition! Can't wait to hear how it turns out. 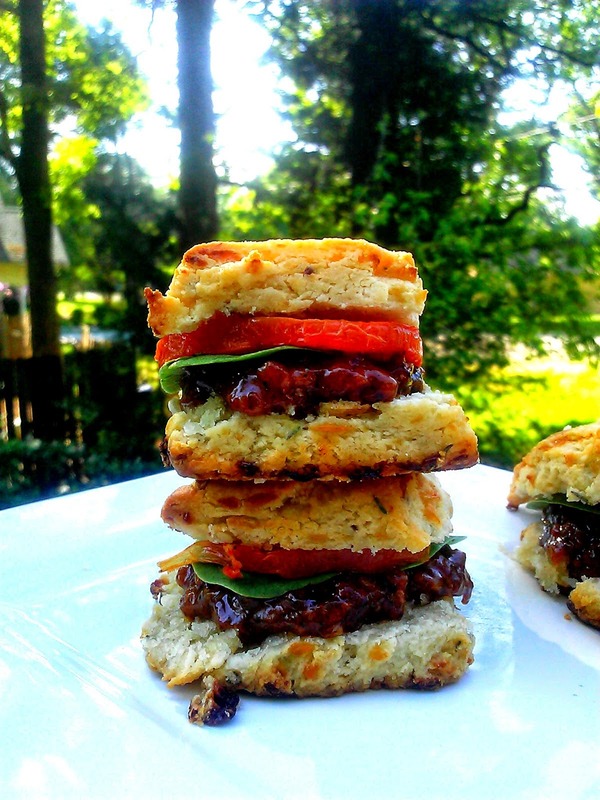 OMgoodness that biscuit tower looks insanely delicious! I've been meaning to make some. Well, Thanksgiving is the best excuse! Holy crap! You're competing in the WFC! Good luck, Nikki! I want to experience the joy that is these biscuits, too. Mmmmm...these look amazing, Nik! I wish I had a couple in front of me right now. Good luck in Vegas - I know you'll do great! Oh wow... these sound positively divine! If there's one thing I can't say no to, it's fluffy, buttery, tender biscuits, and the fact that there's cheese in there makes them even better. Best of luck!! Oh, you don't need luck! You're definitely going to win with this recipe. Love the addition of coconut oil here. I'm making these to go with this week's chili!! How fun! Congratulations and good luck! Best of luck Nikki!! Hope you win! !